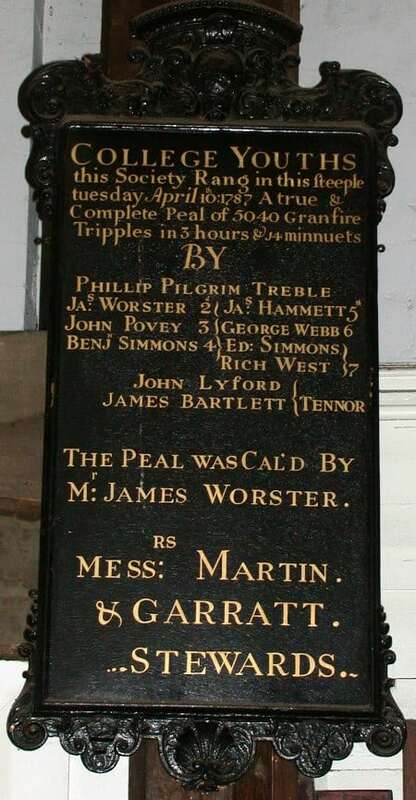 In the Curfew Tower (formerly known as the Clewer Tower or Julius Caesar Tower) there is a peal board erected to commemorate a visit by the Ancient Society of College Youths on 10 April 1787. Grandsire is one of the standard change ringing methods, usually rung on an odd number of bells. The term ‘Gransire tripple’ (Grandsire Triple) used on the board indicates that seven bells were changing during the peal, whilst the eighth bell, the tenor, was ‘rung behind’ as the last bell in each change. The peal involved 5,040 different changes, the maximum number possible on seven bells. This peal board is one of several which adorn the walls of the ringing chamber in the Curfew Tower, the most recent peal board marking two peals commemorating the 90th birthday of The Duke of Edinburgh in 2011 and The Queen’s Diamond Jubilee in 2012.